Blog - Wood or Metal: Which Restaurant Furniture Should You Buy? Wood or Metal: Which Restaurant Furniture Should You Buy? As a restaurant owner, this decision is one which can sneak up on you without warning. You buy all the items listed in your restaurant’s kitchen equipment checklist and get just the perfect signage for your front door, but as soon as you start thinking about the theme of your restaurant and the furniture that goes with it, you find yourself confused. Choosing the right restaurant furniture which affects the overall look of your place in a positive way is crucial, so the simple decision of preferring either wood or metal for your furniture can become very taxing. 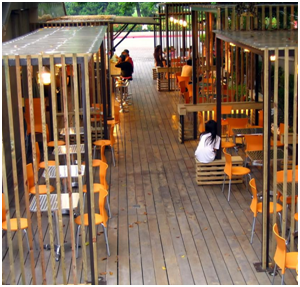 But you need to determine whether deciding between wood and metal for your restaurant would really affect the surroundings and the ambience? Here, we shall delve into the details to help you determine which style of furniture will suit your restaurant the best by comparing wood furniture with metal-framed furniture. Wood furniture adds character and homeliness to the atmosphere, but the best aspects of wood furniture are class, style and elegance. For example, if you pick any furniture option from our Chef’s Deal furniture listing, you’ll notice that each piece of wood furniture is built to emanate a touch of finesse. Wood furniture represents a touch of homeliness and gives a more personal feel to the place, rather than the cool and detached atmosphere one feels with the use of metal furniture. For a restaurant, wood furniture adds a welcoming feel to the overall ambience. After their scrumptious meal, customers would want to relax in a comfy chair that reminds them of home. Although wood is more expensive, many restaurants consider it to be an investment which pays back in the long term. While wood furniture spells style and elegance into the surroundings, metal furniture benefits those looking for something which represents the cool, casual and minimalist theme of their restaurant. Metal furniture exudes easiness and practicality. Metal chairs are built to last for a long time, and because they can be cleaned very easily, many go the metal option for their restaurant. Although many who serve an elite clientele prefer wood over metal, if the theme of the restaurant is leaning more towards trendiness and modernism, then opting for metal furniture will be the best choice you can make. So when choosing the perfect setting for your restaurant, even the best restaurant equipment guide recommends that the most important factor; aside from the budget is to know the sort of impression you want to give of your restaurant, because by understanding this, not only can you design your restaurant exactly the way you always wished it to be, but you can do so with the best furniture you can find.